English football clubs will again be sending more players to the World Cup than clubs from any other country, cementing English football’s reputation as the No1 melting pot for the cream of global football. A new study by sportingintelligence has found that 118 players who earn a living in England – mostly but not exclusively in the Premier League – are in the 23-man squads for South Africa. That equates to 16 per cent of the 736 players. That is a record for any one country’s contribution to the tournament, in absolute terms and in percentage terms. 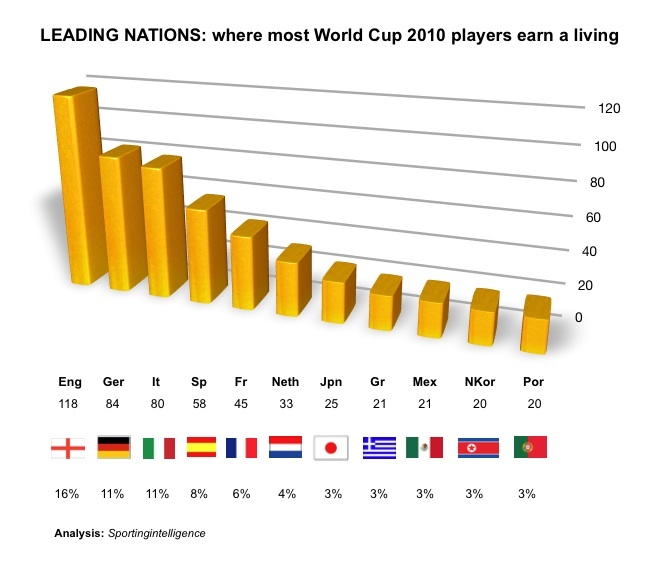 England was also the No1 “contributing nation” in 2006 (with 102 players from 756) and in 2002 (with 105 players), but the number and breadth of representation has grown this year. In 2006, players based in England appeared in 25 of the 32 squads. This time there are English-based players in 27 of the 32 squads; only Italy, Japan, Uruguay, Germany and North Korea have no English-based players. As our first graphic illustrates, England leads the way with 118 players, then comes Germany with 84, Italy with 80, Spain with 58, France with 45 and the Netherlands with 45. It is no coincidence that those six nations also represent the “big five” leagues of Europe plus the Netherlands, a traditional powerhouse international side as well home to a top-six domestic league in Europe. Three teams draw all 23 players from clubs in their own country: England, Italy and Germany. Spain and North Korea (20 home-based players each), then Japan (19) are next in using most players based at home. At the other end of the scale, Nigeria have no Nigeria-based players at all in their squad, while Australia, the Ivory Coast and Cameroon have only one each, and Brazil, Paraguay, the USA, Slovenia, Uruguay, Algeria, Slovakia, Serbia and Ghana have less than a handful each. 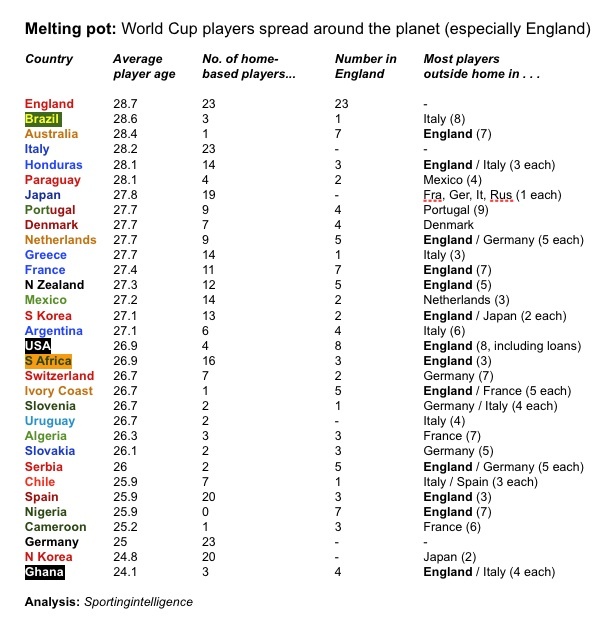 Outside of England themselves, the nations with the most English-based players are the USA (eight players, including loans in 2008-09), Australia (seven), France (seven) and Nigeria (seven). Our analysis also considers the average ages of the competing squads. England’s squad is the oldest on average, at 28.7 years, ahead of Brazil’s, Australia’s and Italy’s. Ghana’s squad is the youngest (average age 24.1 years) ahead of North Korea’s, Germany’s and Cameroon’s. Our second table today (at the bottom) provides all the detail.